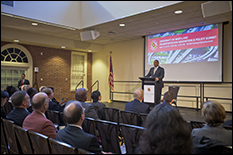 U.S. Secretary of Transportation Anthony Foxx, Maryland Secretary of Transportation Pete Rahn, Maryland State Highway Administrator Gregory Johnson, and FHWA Office of Transportation Management Director Robert Arnold were among the featured keynote speakers. They were joined by NTC@Maryland and peer university transportation center representatives, as well as experts from the UMD Center for Advanced Transportation Technology and National Center for Smart Growth. Each of the day’s speakers emphasized technology and policy innovations for reducing congestion, and the impact of transportation on both local and national economies. Foxx stressed the need to overcome the challenges that stovepipe federal regulations present as the country works to meet 21st-century demands for transportation innovation. “In order for us to break through and achieve greater results for our overall system, we’re going to have to rely on the state and local governments to think in an integrated fashion about their assets,” he said, touching on the critical importance of the Department of Transportation’s (DOT) Beyond Traffic framework. The document, which maps U.S. DOT’s 30-year framework for U.S. transportation, underscores critical decision points driven by data analysis, research, and expert opinions. One of the areas from which transportation planners must pull data is driver behavior, Administrator Johnson noted. 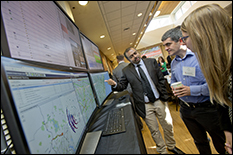 Knowing well the benefits of collecting big data to evaluate transportation systems, UMD’s Center for Advanced Transportation Technology Laboratory (CATT Lab) collects billions of data points each day on transportation systems across 26 U.S. states. CATT Lab director Michael Pack offered an inside look at what the team calls RITIS—the Regional Integrated Transportation Information System, an automated data-sharing, dissemination, and archiving system that includes many performance measure, dashboard, and visual analytics tools to help agencies gain situational awareness, measure performance, and communicate information between agencies and to the public. “The goal of this system was originally to go out and work with D.C., Maryland, and Virginia to grab all of the relevant transportation data—anything you can possibly think of that might affect a transportation system, such as congestion and incident management—bring it together, from each of those different states, and then be able to standardize it, fuse it, and share it with each other so that if an incident was going on in Maryland, D.C. and Virginia would know about it—they could know about it—and vice versa,” Pack said. Today, 26 states across the country use RITIS, for which the CATT Lab manages data points on everything from basic traffic speed and volume and bus and train schedules to censor measurements and GPS data. From probes alone, CATT Lab collects almost 6.5 billion records every single day—and they estimate that number will jump to 8 trillion records per day in as little as a year and a half. But, the CATT Lab’s end goal extends beyond reporting this information to constituents. They also hope to use this information to analyze—and even predict—how factors will impact a transportation system in real-time. One key area in which predictive capabilities would prove valuable is incident management. 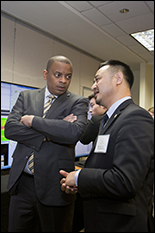 Further emphasizing how critical it is to plan and adapt for the future of transportation, Administrator Johnson echoed Secretary Foxx’s concerns about funding constraints that limit the ability to make the vision of 21st century transportation a reality. And, the focus of transportation development cannot be separated from that of economic development, Secretary Foxx noted. 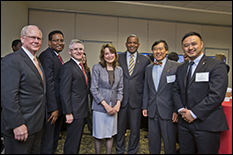 The event was also attended by UMD President Wallace Loh, Provost Mary Ann Rankin, Vice President of Research Patrick O’Shea, Clark School Dean Darryll Pines, and Department of Civil and Environmental Engineering Chair Charles Schwartz. Thirty-two undergraduate and graduate students from eight universities across the nation also showcased more than a dozen new technologies they have developed to help mitigate traffic jams across the country. 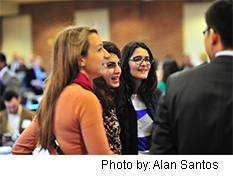 All featured photos were provided courtesy of John T. Consoli/University of Maryland unless otherwise noted. Alan P. Santos provided additional photography support as well.